R3 WinCenter's Proposal Management is designed to support the needs of Federal Government Contractors. It is designed for complex proposals, where the work centers around documents. It goes beyond just document management. 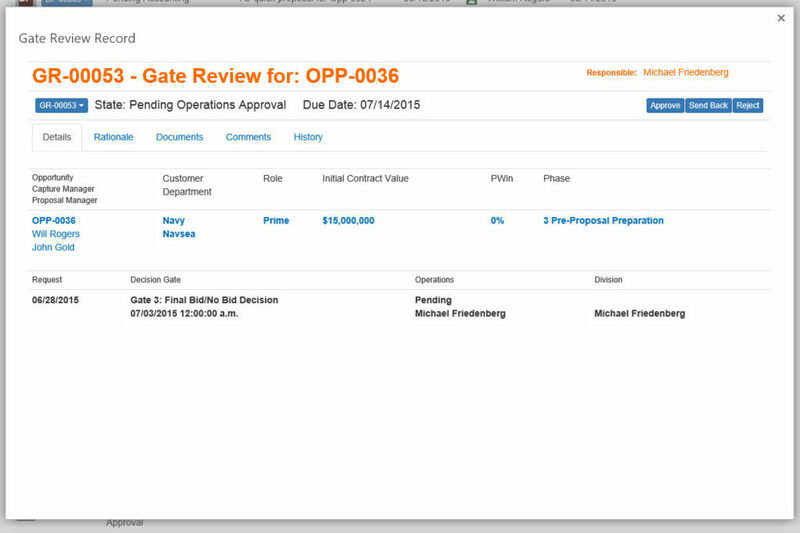 It streamlines and automates proposal work so your team can focus on quality. It supports GovCon best practices of color reviews and gate reviews. With R3 WinCenter, you great proposal management as part of a comprehensive system to win Federal Government Business. Streamlined Proposal Work. Better Proposal Management. Streamline and automate proposal development. Real time visibility and collaboration. It's time that the software did the flexing to meet your needs. WinCenter streamlines and automates the work of getting each proposal done. It eliminates a great deal of manual, administrative work, and, the distractions. Participants can now focus on the work that drives quality results. Keep control over the documents and the work in your Proposal Console. Manage the documents. Assign the work. Instantly see status changes. And, know "whose got the ball" at any time. It saves you time and keep things organized. We make it easy, convenient and efficient to reuse proposal assets from a central knowledge repository. They are put at your fingertips where and when you need them. The reuse drives greater consistency and quality. Make it easier for writers and reviewers to do their work. With My Work, they see just the assignments that they need to work on. They can collaborate on the documents. They can work in co-authoring mode (multiple people working at one time). Making it easier drives participation and saves everyone time. Color Team Reviews are a standard best practice for proposal organizations. They require document preparation, scheduling and coordination, collaborative reviews, comments and comment management, debriefs and follow through. WinCenter simplifies this work by streamlining and automating the activities and providing a rich collaborative experience for all participants. It's one thing to manage a single proposal. But, most organizations struggle with managing multiple proposals in parallel. WinCenter provides you with top down visibility and collaboration across all of your proposals. It makes a portfolio of proposals manageable and drives greater effectiveness. Visibility. One Team, Same Page. Get real-time visibility into your portfolio of proposals and the details of each one. Everyone stays on the same page – literally with our 360⁰ view. Better visibility means better decisions and the ability to act at a point when you can make a difference in the outcome. Each proposal has a schedule. The challenge is to manage and coordinate the schedule across all of your proposals. With WinCenter, we make that happen and go further to enable people to use the schedule to get work done. We manage Customer Milestones, Internal Events, Gate Reviews and Color Reviews. Organizations have cross-organizational processes that support proposal efforts. Examples are Gate Reviews, Bid & Proposal Budget Approvals and Subcontractor Agreement requests. WinCenter makes process work vastly simpler for all users and more effective. It gives them one place to go for all of their process work. And, you get visibility into your processes across your proposals. Every organization manages their proposal work a bit differently. And, even individual proposals are different – some large, some small, some just more complex. They also change as they progress. To optimize your work, you need software that can accommodate these differences and changes. WinCenter is unusually flexible software. The features for change are built-in to empower you to change WinCenter to meet your needs. You are no longer limited by your software. WinCenter provides you with a role-based experience. We make it easy for you to change who has access to what and what they can do. This enables you to make the experience far simpler for the casual user which reduces training and drives user acceptance. On the flip side, you can provide your power users with everything they need. Proposals are different. Proposals change over time. They may start out more simple and become more complex as they progress. You can change the proposal experience real-time as they progress. You can turn features on and off with a couple of clicks using the Design Canvas shown here. We don’t provide everything you may need out-of-the-box. But, you can. WinCenter comes with built-in, easy-to-use configuration wizards that empower you to customize existing features and even add your own. You are no longer limited by your software. Request a private demonstration to see proposal work getting done using R3 WinCenter. A great deal of work goes into Federal Government Contractor proposals. They are complex proposals. WinCenter goes beyond just document management systems. It delivers work management capabilities designed to help GovCon Proposal Managers drive the work. It automates work through closed-loop processes that drive users back into the system to their My Work area to get the work done. They see just the work that they need to get done – writer assignments, ad hoc reviews, color team reviews, action items. This eliminates the chaos, distraction, and noise of random email, calls, activity, multiple places to go to find information and multiple versions of documents. SharePoint and most other document management oriented systems use libraries and folders to store information. As a result, you cannot know what is in there without drilling into a library or folder. WinCenter uses the same foundation but alters the experience. WinCenter uses Work Displays that allow you to see, contribute and act across libraries and folders. You no longer have to drill into libraries and folder to see what is there. The information comes to you in the context of the work that you need to do. You can then act on it. This is a critical part of being work centric vs. document centric. SharePoint is used as the core foundation for data, security and administration of WinCenter. It also leverages the core SharePoint capabilities of document management, collaboration, and workflow. The document-centric features you expect such as document security, check in/check out, version control, records management, co-authoring – are all there. Individual proposals have their own secure workspaces. But, one look at WinCenter and you wouldn’t even know that it is SharePoint. WinCenter goes much further, providing a user experience that is work centric vs. document centric. It overcomes the constraints of SharePoint and transforms it into a platform for managing proposal work as part of an integrated system for capture and proposal management. With WinCenter, you are now doing your proposal work in the same system where your business development and capture management people work. This is by design as WinCenter is designed to integrate the work of BD, capture, and proposal development in support of a single corporate process. The result is that all customer and capture information and activity is at your fingertips as you do your work. You have full visibility into the opportunity pipeline across all phases of the life cycle. You have master calendars and schedules to get the big picture of activity. With WinCenter, everyone is now on the same page. WinCenter makes it super convenient to reuse valuable knowledge and process assets. It allows you to centrally manage your capture and proposal development knowledge and process assets. That is the start. Then, the assets are put at the fingertips of users when and where they are working. This means that users, working within any proposal workspace, no longer have to go somewhere to find and reuse assets. This convenience means that it is now easier for users to do the right thing using the right assets. Once proposal work is completed, it is a single click to submit assets into the onramp of the asset library for review and publishing. With WinCenter, you get a 360 degree, virtuous cycle of better assets and more reuse. This drives better results. Security is fundamental to proposal work. Using SharePoint, you can secure documents and data. WinCenter provides an additional user layer that removes the user from working directly in the data, a risky way to work, and that supports easily configurable role-based security. This makes it easier to manage permissions and put the right information and functionality at the fingertips of users from across the work environment. With WinCenter, security is just better and easier for proposal work. With WinCenter, while you are working in a shared environment, you can still have it your way. You can control your way of working and tailor to the proposal. You can easily turn features on and off to match the scope of the proposal such as what Color Team reviews will be used. This flexibility enables you to have different styles of workspaces such as those for Task Orders that have a lighter work process vs. those for standard RFP or complex RFPs. You can even have your own virtual proposal center with your own view of the opportunity pipeline, assets, information and your proposal activity.